In contrast to a trial jury, which is asked to reach a verdict based on evidence presented during a civil or criminal trial, a grand jury meets in secret to consider whether there is sufficient evidence to justify a formal criminal charge against someone. That formal criminal charge is called an “indictment. A grand jury has 23 members, and meets once a week, always on the same weekday. (Grand juries do not meet on weekends or Mondays.) The average workday is 5 hours. Absences for medical appointments, vacations, graduations, etc. may be accommodated, but 16 members must be present for the grand jury to conduct business. A grand jury designated “investigatory” meets for a 12-month term, while a grand jury designated “accusatory” meets for a 6-month term. Based on the number of grand juries to be selected, the Court will direct a sufficient number of prospective grand jurors to report for service. 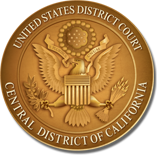 These prospective jurors will have an opportunity to appear before a United States magistrate judge and request to be excused or have their jury service postponed because of business, employment, or financial hardship. If such a request is granted, the juror will not receive any fees for reporting that day. From the prospective jurors who report and are not excused or postponed, the Jury Clerk will use a computer program to randomly select 23 members and 10 alternates for each grand jury. If you are not selected as a grand jury member or alternate, you will be excused. Your service is then considered completed, and you are entitled to receive payment. If you are selected as a grand jury member or alternate, please expect to stay until 1:30 p.m.
On grand jury selection day, please park at the Music Center, 135 N. Grand Ave. Your jury summons will entitle you to park at no cost. On all other days, please park at 414 East Commercial St., Los Angeles, CA 90012. When you appear for jury service, show the parking attendant your summons or badge. Your ticket will be validated at the courthouse. Please allow yourself at least 20 minutes to walk from the parking structure to the courthouse. If you park at any other lot, maximum reimbursement is $5.00 per day with receipt. Please park at 201 West Third Street, Santa Ana. Your jury summons will entitle you to part at no cost. Please park at 3535 Twelfth Street, Riverside. Your jury summons will entitle you to part at no cost.